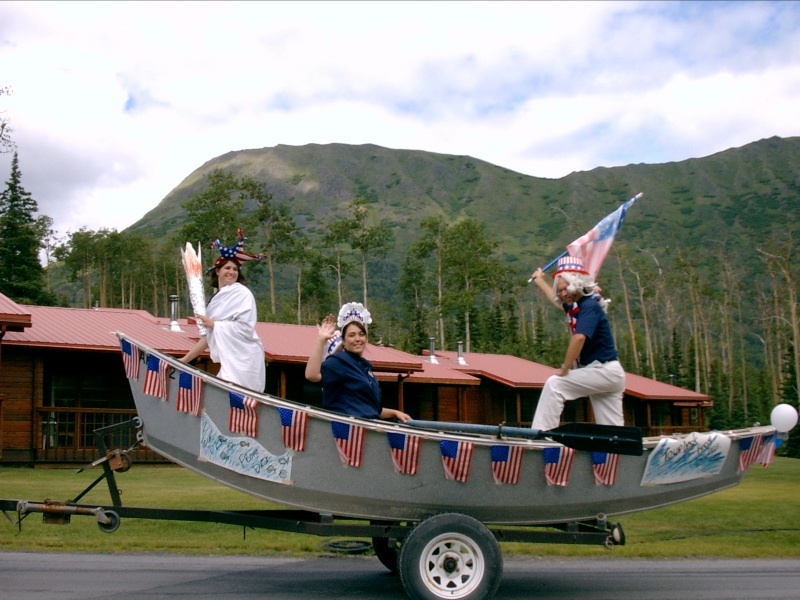 Pull out your red, white and blue and head down to the Kenai Princess Wilderness Lodge in Cooper Landing this Wednesday for a uniquely Alaska Fourth of July celebration. Every year the lodge pulls out the stops to celebrate Independence Day with lodge guests and the Cooper Landing community on its expansive property with a good old-fashioned Fourth of July parade. This year’s theme is “North to Alaska,” and the community – from elementary school kids to senior citizens – has rallied together to create fun floats that will be paraded up and down Frontier Circle. The parade begins at 4 p.m. and spectators can expect to see elaborate floats like the lodge’s housekeeping department donning princess costumes atop a replica of a Princess Cruises’ Sapphire Princess ship, while gift shop employees will celebrate with a “Christmas in July” float. The local school children will parade their “Hooked on the Kenai” float, complete with hook, line and sinker. For the grand finale, the local senior citizen center will be pulling a saloon and jail while the ladies of the senior center will be dancing the can-can and urging spectators to grab their friends and have them “arrested” for funny pictures in the jail. Come down and spend a few days at Cooper Landing and enjoy all the Fourth of July festivities. Fishing, river rafting and horseback riding tours are available for booking through the Kenai Princess Wilderness Lodge, among other activities. We’ll see you on the Fourth!